A starter intended to make the "single-with-child" beginning family a little easier. 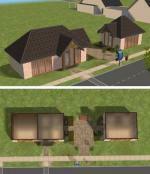 House has a small second bedroom and shared bath with large great room and fenced back yard, carport. 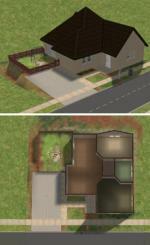 New roof created by me is included in zip (roof was originally posted on www.simsshoppe.com). 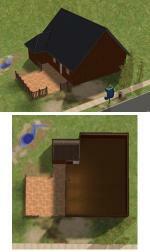 Two quaint buildings with a patio between - great for your sims salon or high steet shops. Overgrown private hide-out is perfect for gambling dens, underground clubs, pirate galleys or other establishments that don't want to call too much attention to themselves. Hidden Vale: Surrounded by mountainous country on three sides and water on the forth, a single bridge leads into this very secluded community. Main .png plus four terrain type pictures included; lush, concrete, desert and dirt. Installation instructions in the jndregion_readme.txt included. The Plateau: Multi-level tiered community with building spaces in flat and sloped areas. and 3 Plaster walls (under Poured). The dining table requires Nightlife, but the other objects are all cloned from basic TS2 objects. All objs were modeled and textured by me in Carrara and milkshape. As usual, credits (and thanks) to Numenor, RGiles, Quaxi for creating CEP and SimPe!